Each year, the United States used 85.5 million tons of paper, of which we recycle 22% or 19 million tons. Of the remaining paper, we could recycle up to 70% or 46 million tons. And those 46 million tons could save 782 million trees. Every day, Americans buy about 62 million newspapers and throw out around 44 million of them. If we recycled just half our newsprint every year, we would need 3,200 fewer garage trucks to collect our trash. An average American uses 465 trees to create a lifetime of paper. Americans throw away the equivalent of more than 30 million trees in newsprint each year. Americans discard 4 million tons of office paper every year. That's enough to build a 12 foot-high wall of paper from New York to California. Recycling half the world's paper would free 20 million acres of forest land. Recycling one stack of newspapers about 6 feet tall saves the life of one tree 35 feet tall. Recycling approximately 1 ton of newspaper saves 17 trees. Every ton of recycled paper saves approximately 4 barrels of oil, 4,200 kilowatt hours of energy and enough energy to heat and air-condition the average North American home for almost 6 months. Recycled paper is made to the same standards as paper made from virgin pulp. Moreover, recycled paper has features which make it more desirable than virgin paper, such as being more opaque, dense, and flexible. Paper plus cardboard combined make up 73% of the materials in the landfill. For every 15,000 tons of old newspaper recycled annually, 30 jobs are created to collect the paper, 40 jobs are created to process the paper, and 75 jobs are required to manufacture the newsprint. Making a ton of virgin paper requires 3,688 lbs. of wood, 24,000 gallons of water, 216 lbs. of lime, 360 lbs. of salt cake and 76 lbs. of soda ash. We then have to treat and dispose of 84 lbs. of air pollutants, 36 lbs. of water pollutants and 176 lbs. of solid waste. Hand papermaking began in China. A description of papermaking was first written in the 2nd century CE. 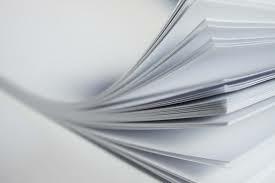 Most paper is made from wood cellulose. A sheet of paper is held together by hydrogen bonding. Papermaking was brought to Europe by the Arabs. A Hollander is a device for beating fibers for papermaking. The web and frame combination used in hand papermaking is the mold and deckle. Two common additives to paper are sizing and coloring matter. Before the final papermaking step of pressing there is 90% water in paper. The U.S. consumption of paper and paperboard in 1999 was approximately 354 kilograms (about 800 pounds) per person. In the last 20 years, the combined usage of today's top ten paper users has increased from 92 million tons to 208 million, which is a growth of 126%. So the use of computers is not slowing the amount paper we use.